I work on my feet all day long, from shoots to filming TV and running around Dublin and most of Ireland to do my job. With this in mind I have to look after my feet, and I have been a long standing fan of Skechers. Aside from the support each pair gives, I feel I never have to compromise on style with either sneakers or shoes, and some of my most loved blog posts have been wearing some form of Skechers footwear! My followers on instagram love my shoe posts and in particular how I style my Skechers in each of my pictures. Me and my Skechers have been everywhere together in 2016! Most recently, I traveled to Africa on a charity trip where I was out filming on mountains, remote villages and even Kilimanjaro! For those few important days I wore Skechers lightweight sneakers to keep my feet cool and comfortable. I cannot tell you how much I love Skechers Memory Foam! Every time I put on my trainers, my feet soak up the sponginess that encases them! I swear my feet have never been so happy! I love black trainers as I wear them with skirts and tights as much as I do with my favourite skinny jeans. My favourite pair right now have a snake skin print on the soles which gives a nod to the trend of the season! I wear these to work but also to the gym! I love strength and conditioning training and when I am lifting weights I need to have my feet level on the ground. I find Skechers gives me the centre of gravity I need to support my feet and legs when I train. You have to protect your body when working out, so I started wearing Skechers GOrun or Skechers GOtrail depending on the terrain for this great support they give me. Runs have never felt this great! I’ve recently converted my Mum to wearing Skechers too for when she walks, and I am glad to report that she’s a fan too. We even have some of the same pairs! 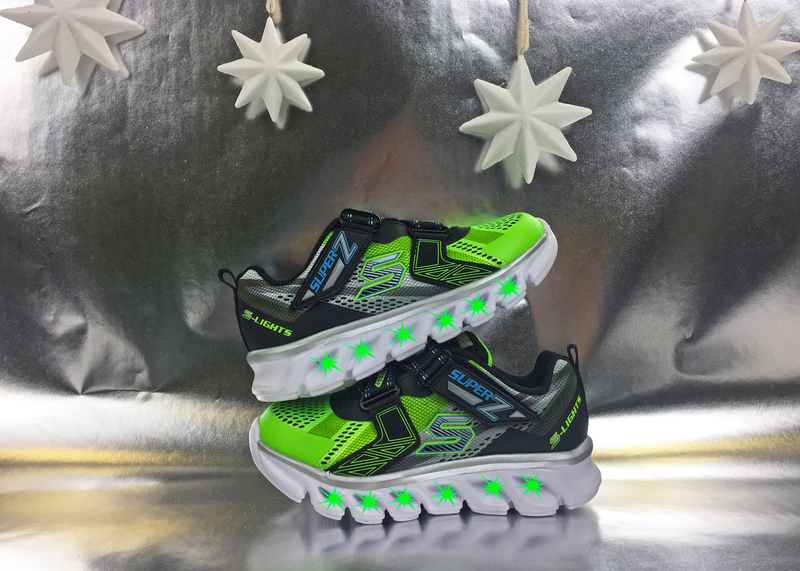 For anyone who wants to have a balance of supportive footwear for walking, training or just your regular day, there’s a Skechers shoe for you. Lorna Weightman is one of Ireland’s leading fashion commentators and television personalities who shifts her time between Dublin and London. She’s contributed to many major Irish publications and can be seen often on television as a stylist and commentator speaking about the latest trends and fashion news. Visit her blog at beaut.ie to keep up with her latest styles and be sure to follow @styleisleIRL on twitter and instagram! For pet lovers everywhere it’s hard to find anything that brings more joy to the world than our four legged furry friends. And with the holiday season in full swing now that we are deep into wrapping paper, we turned to Instagram to find some of our favorites. Maya seen above looks nothing short of adorable with her reindeer ears. 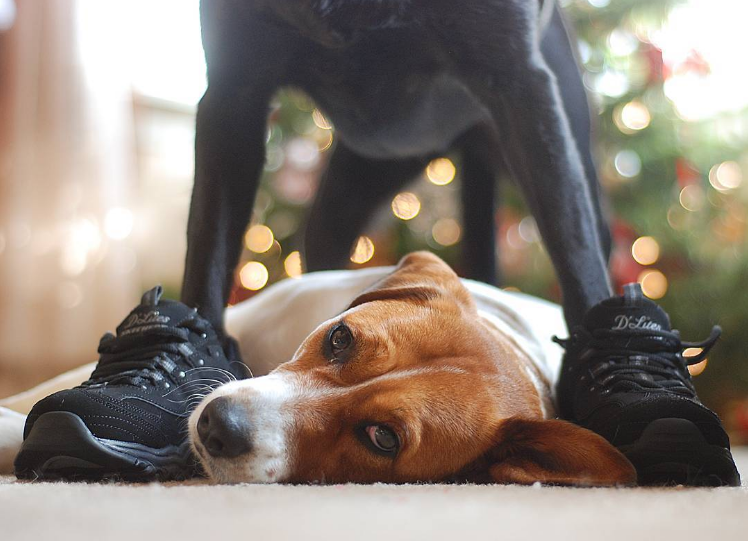 We imagine she just brought in that pair of Flex Advantage 2.0 sneakers to surprise her daddy on Christmas morning. Follow @mayathedox to see more! The felines seem to approach the holidays in different ways. Albert (below, left) is ready for the snow in a cozy sweater. He couldn’t care less about the cold when out and about with his human friend wearing the Relaxed Fit Marselo boot built to tackle the elements. See more at @albertbabycat. Some cats take on the role of dogs and protect property at all costs. Mick (above, right) sits stoically guarding a pair of Mecca – Sawmill boots for a young boy in the house. He’s daring you to try and challenge him and won’t rest until these shoes are worn and enjoyed in amazing snowplay. Emma (below, left) takes a more…we’ll call it direct…approach to the job. This little girl won’t ever let these cozy BOBS Plush slip-ons leave her paws! If you need to go out you’ll probably have to suffer through copious amounts of kitty cuddling first! Follow Mick at @meowing_mick and Emma at @furryboy.leo. For a cool Yorkie who is beyond ready to open presents check out Joey above. Have you ever seen a pup more eager for present time to begin? The cleverly positioned men’s Mark Nason Parker boot and women’s Winchester – Mysterious boot send a covert signal that he’s ready for a walk. Like right now. As seen below, Lucy and Emily can get by without a human friend. At least that’s what Lucy wants you to think as she’s put on a pair of D’Lites herself and is all set for the adventures that come. Emily clearly isn’t having it and despite Lucy’s best wishes will still beg for endless petting. Joey can be seen @joey__bateman and follow the ongoing mischief of Lucy and Emily @pupsonpar. Last week in the spirit of the holidays we held a Skechers pet adoption event for the first time at our headquarters in Manhattan Beach. Our BOBS for DOGS charity partner Best Friends Animal Society stopped by with an adoption van and information for new pet owners. Countless essential items were donated to local pet shelters and everyone from the office loved hanging out and spreading cheer with dogs and cats for an afternoon and the puppy and kitty below (plus another kitty) found lucky new parents and forever homes! Learn more about the No-Kill LA initiative here. We love seeing furry friends! If you have cool pictures of your pets please share on Instagram with #PetsOfSkechers. Maybe we’ll feature you next time! Happy holidays! Want us to let you in on a little secret? If you are one of those people who likes simple and trendy but struggles to choose between the two, the time is NOW to jump on the Black and White sneaker look. Team Skechers is here to help you introduce this hot current style into your daily fashion! Fads may come and go but having those basics on your feet won’t because of one simple fact: they pair with EVERYTHING! You can style them with velvet purple overalls or funky patterned pants. 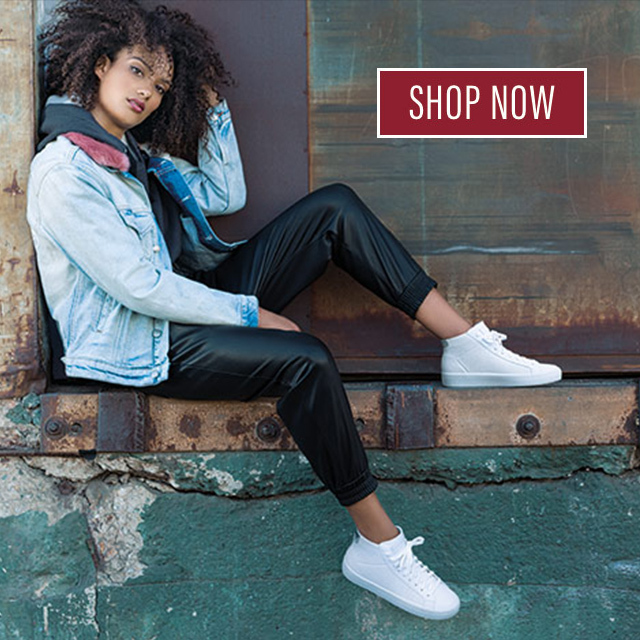 No matter how out there or fashionable the outfit, a sneaker like the black leather Omney – Kort Klassix or knitted white Skechers Burst – City Scene will do just the trick. This is the ultimate unisex trend, so men pay attention too! Whether you need black, white, or black AND white sneaks, Skechers has got you covered for all occasions. The comfy casual man can rock this look in a pair of DressKnit Mark Nason Monza slip-on loafers and the street sleek gal can work it in the retro Skechers Originals OG 90. No matter how you hit the town, this look can work for you! With countless options for both men and women that fit the B&W sporty sneaker trend, you won’t ever need to think about coordinating an outfit for those 2017 New Year gym sessions! To complete the gym look, wear a colorful pair of work out shorts or top with your black and white sneakers. The color will pop while also bringing attention to the shoe! Start sweating your way to your resolutions in the Flex Advantage 2.0 for him or the Skechers Burst for her. Now that you’re all caught up, be sure to stock up on those Black and White essentials. You can find even more options for women here and men here. And thanks to the Air-cooled Memory Foam insole in every pair, you will be on-trend with comfort included. No more standing in front of the mirror deciding what to put on–with a pair of black and white sneakers you can wear whatever you want—even those velvet overalls! Great boots are even better with a great stylist! We asked Michelle’s Paige how to dress up our most popular Skechers boots of the season… read on for three new ways to dress up your look. I don’t know about you all, but when the temperatures start to really drop, so does my patience for putting together cute looks. All I really want to do is stay cuddled in my PJs and binge watch Netflix all day… but that’s not realistic for a gal on the go. In my mind, a good outfit starts with a good pair of shoes, so I’m thrilled to be teaming up with Skechers to round up a few easy ways to look cute this winter without sacrificing your style. First up, I’m wearing these snuggly Skechers Keepsakes – Peekaboo booties that are so cozy and warm, I feel like I am walking around all day in my slippers! I definitely wanted to showcase peeks of the faux fur interior and the tweed fabric, so I paired these booties with cozy socks and basic black leggings. I completed this look with an oversized poncho sweater which added to the comfy nature of this overall outfit, making it perfect for cozy weekends. These booties are available at select Skechers stores. Next up, I’m wearing an all-weather winter look thanks to the Skechers Highlanders – Portland boot. (You can’t tell in these photos, but the ground was still wet after a rain storm, so I was sinking into the mud!) So you can trust me when I say having these boots are perfect for trudging through fall/winter snow, slush and overall gross, muddy weather! I love that unlike most classic rain boots or duck boots, these have Thinsulate™ insulation for added warmth and comfort. Plus, the tan and navy color of these boots perfectly fits into my cold weather uniform of skinny jeans and neutral sweaters. Last but certainly not least, I’m showing you all how I dress up a pair of winter booties. That’s right – it’s possible to wear a pair of winter boots in a glam way! Usually when I head out to a holiday party, I wear my winter boots and then bring an alternate pair of shoes to slip on once I arrive at the party. With winter booties this cute, there is no need to change! They even have a hidden mini wedge! I decided to go for a monochrome black and gray look while wearing the Skch Plus 3 – Trois booties (at select Skechers stores). The darker shades keep the look sleek and make it look even dressier. I added polka dot tights and a red lip for some fun accessories and to help break up the dark shades in this look. Which outfit was your favorite? How do you style your winter Skechers styles? Michelle’s Paige is a personal style blog hoping to inspire visitors to take risks and test out trends as they get dressed each day. Check out Michelle’s site and her pages on Facebook, Twitter and Instagram. HEADS UP FOR SHIPPING DEADLINES! 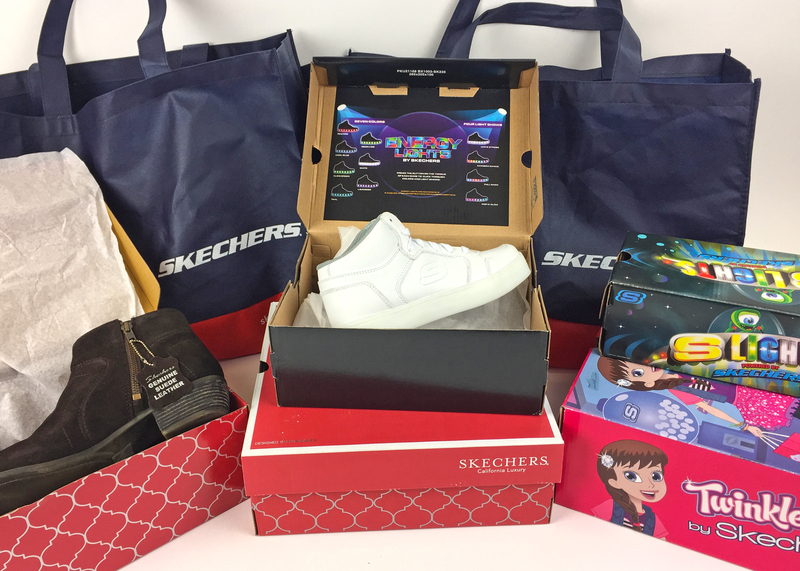 Everyone loves a new pair of Skechers for the holidays! And if you need some last minute ideas for your family and loved ones, check out our prior posts with cool options for men, women and kids. There’s sure to be an idea there perfect for someone on your list. We try to make footwear shopping as easy as possible, but procrastinators be warned—our shipping deadlines are fast approaching! 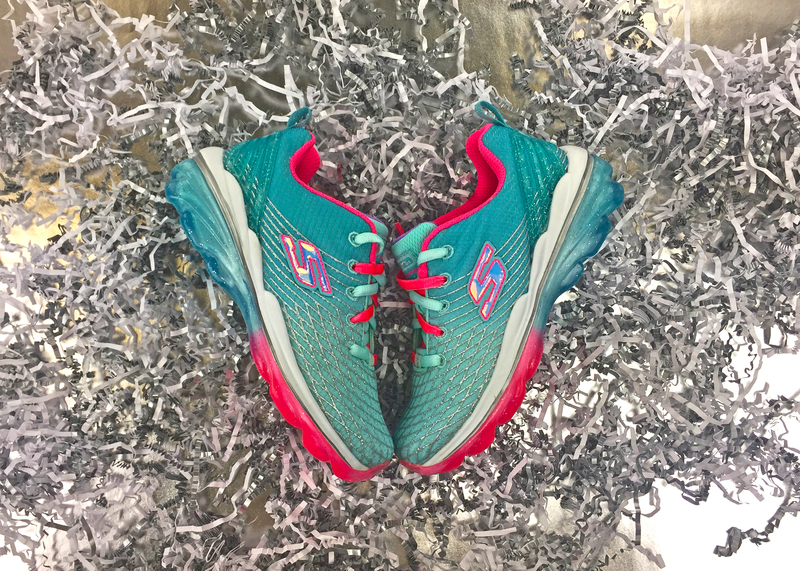 If you still need a gift after the above deadlines pass, we have an additional e-Gift Card option that allows the recipient to pick out his or own pair in Skechers retail stores or online at skechers.com. The deadline to order an e-Gift Card is December 21 at 5PM PT. Go here to order. As a final option if you need to pick up a pair of Skechers at the very last moment, our retail stores will still be open on December 24. Find your nearest store here—holiday hours may vary, so call to confirm closing time if it’s late that final day! 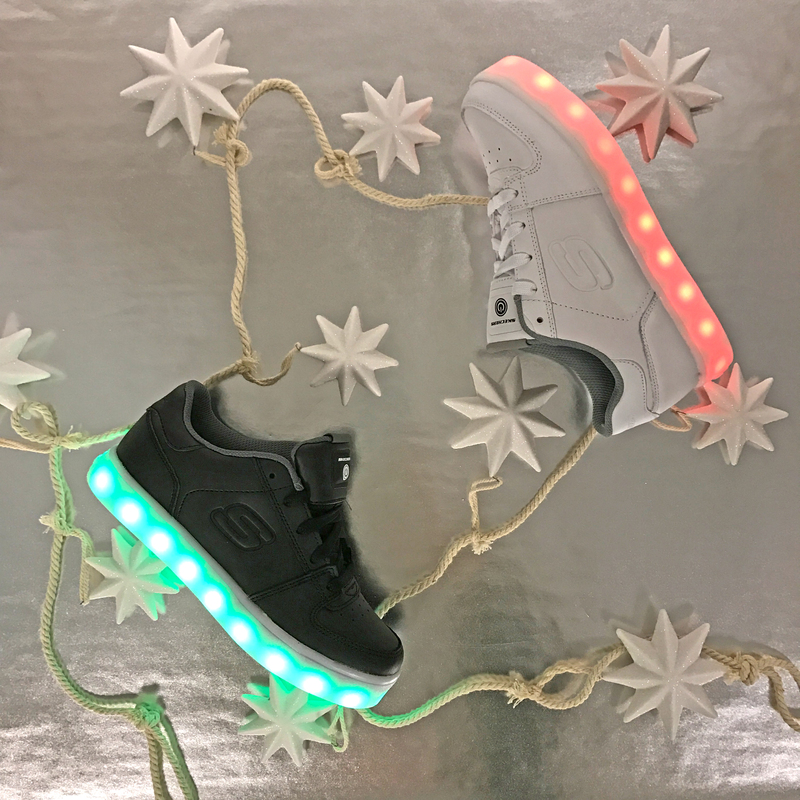 Energy Lights rechargeable sneakers are one of our hottest trends for kids and teens – take a look and you’ll see why! Boys and girls have been pouring into our stores demanding these (we even have adults trying to get a pair). Whatever your favorite light shade – red, green, blue – this street style can change colors and modes, run for hours, and quickly charge up to hit the streets all over again. These make the perfect gift! 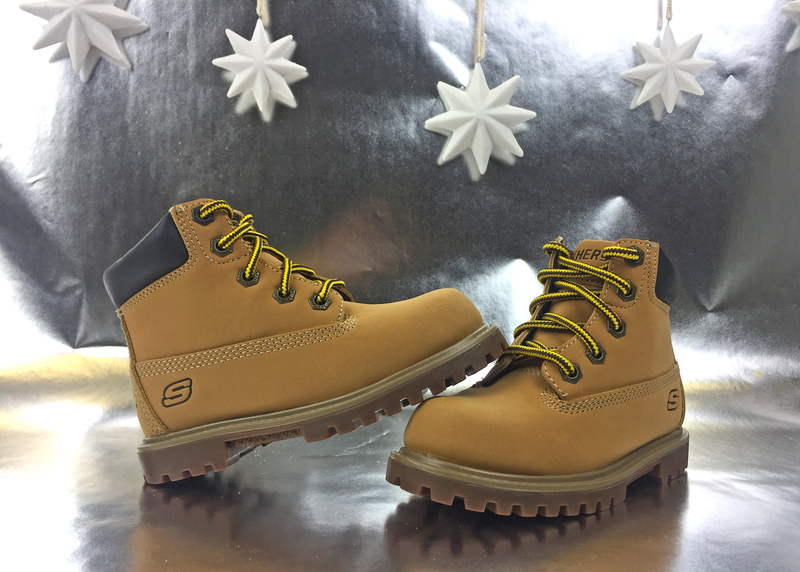 Way back when, Skechers started out as a utility boot brand – and these Mecca – Mitigate boots for boys and girls have been a cute classic for years (they’re better than ever now with comfy Skechers Gel-Infused Memory Foam insoles). These are perfect for trekking around the playground and looking all-around adorable during winter break and beyond. For younger boys, these S Lights: Hypno-Flash sneakers have been a big seller. We love how great they look for day as well as night – the cool lime and black fusion ombre design, and the sweet-looking outsole. With features moms and dads love (easy-on Z-straps) as well as kids (cool flashing lights) you can’t go wrong with these. Belle of the ball! Girls absolutely love these Twinkle Toes: Glamslam – Lil Lovelies boots – how could they not? Cozy cuteness, aqua pom-poms and glittery hearts make these soft suede, sweater knit and faux fur booties tops on every girl’s list. A sure hit for her first week back in school in 2017! OMG – we ❤ ❤ ❤ these!! Emojis are all the rage – and these Twinkle Toes: Shuffles – Expressionista sneaks are right on-trend. Little girls will love expressing themselves in these fun and fearless Twinkle Toes emoji sneaks – decked out with glitter, satin and bling. Icy aqua is still a popular trend, and these Skech-Air Deluxe sneakers are such a fresh and cool take on the shade! They’ve got subtle pink pops and silver details that we just love. Plus girls will love walking on actual air in the midsole (and the soft air-cooled memory foam). This is a perfect style that she can use everywhere she goes, from home to school. Need to grab a few more gifts for men and women on your holiday list? Check out our top winter trends for him and her – and let us know your favorite kids’ styles in the comments!